Last time I imported a bit mapped graphic cartoon into a drawing element using the “import and vectorize” command “with texture” as the vectorization type. 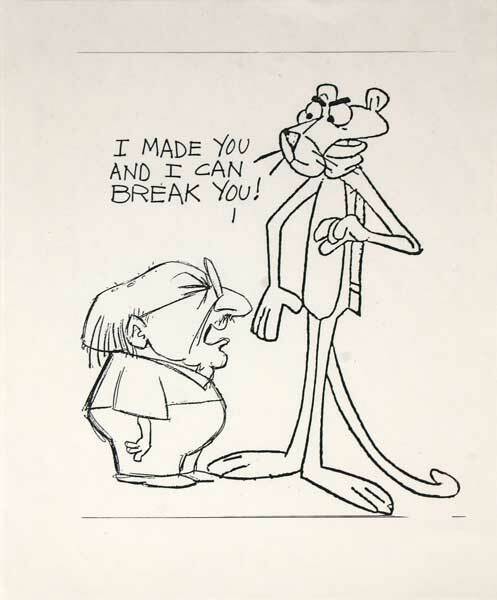 Next I copied the first cell and using the copy of that cell, I cut out the character of Friz Freleng. You can review the process by reading Part 1 of Introduction to Photo Cut-Out Animation. I’m going to cut the Panther into multiple body parts and put each part into a separate drawing element then I’ll rig the character in camera view on the timeline. As I cut out the parts of the Panther, I also am using the contour editor, the eraser tool, the paint tool and the brush tool to fix up the parts so that the cut-out character can seamlessly be assembled and animated. This is the torso with a modified scarf. Here are the final composited characters in drawing view so now I’m ready to switch to camera view and start rigging them. I’ll start out by adding a peg element for each character to act as the top level parent in their hierarchy. Then I’ll attach the body parts of each character to their top level parent peg. Next I’ll organize the body parts of the Panther character into two logical groups, one of the upper torso and one for the legs and tail. I’m almost ready to begin keyframe animating but first I need to use the scene operations rotation tool to set the rotational pivot point for each body part and for the parent peg elements. With all the rotational pivot points set, I collapse my two top level parent pegs and using “extend children exposure” a new command that was added in TBS V 4.0, I extend my timeline out to 160 frames for each character parent peg and all its children. The animating is just straight forward keyframing of the character’s body parts using the scene operations transform tool. I added a bit mapped background in an image element and added a fade to black transition at the end of the animation. If you are not familiar with keyframe animation, I suggest you review my previous series on Key Framed Animation. Click here to view the final animation. Thank you very much for the time and detail you put into this. It's been a huge help to this fledgling Toon Boomer. I'm always pleased to hear that something that I worked on has been helpful or inspirational. I'll do my best to continue writing for this blog and trying to publish useful articles and tutorials. Thanks for ur aportation man! I've looked over your tutorial 4 times now, and have come over a problem when putting it in to action. I have copied and pasted the same frame about one hundred times, however, when I try to change a single frame all of the frames I have already pasted change aswell. I've tried to correct this problem myself but nothing seems to have worked. Am I doing something wrong or have I missed a step? Could you please post a reply to explain, in great detail, what I am doing wrong and how to solve this problem?! I'm not sure where in the process you are copying and pasting a frame. I used extend exposure in this article to set up the timeline for keyframing. You should stop and take the time to read through the two articles I have called Toon Boom Fundamentals The Basics Parts 1 and 2. Your current question seems to suggest that you are unclear on the concepts of exposures and frames. Basically you are taking a single exposure and extending it across multiple frames but extending an exposure doesn't create new drawings that are unique and independent it merely causes a single picture to be held on screen for some period of time based on the number of frames used in the exposure set. As I clearly explain in Toon Boom Fundamentals The Basics Parts 1 and 2. Key Framing is how you control your animation camera stand. In this example the character is a single exposed picture and we animate it by changing how the various parts of that cut out character picture are displayed by our camera stand over time.The actual drawings themselves are never changed.